Are you totally loving this fabulous Christmas collection, I’m so in love with this little deer it’s totally cute but everything about this collection is totally adorable and I really love the colours and patterned papers. Each year we would go and take photos on Santa’s chair in the shopping centre as our youngest daughter was terrified of Santa and would non stop cry so this was the best idea to get that happy Christmas photo. Then I mattered my photo on patterned papers from the 6x6 paper pad then added it to my card stock just tucking it under the edge of the tree. 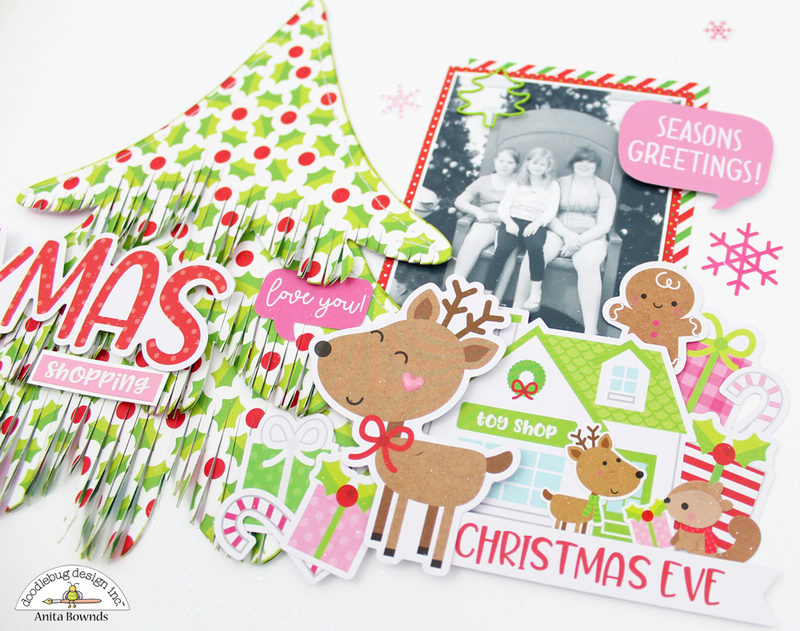 Then I started adding die cut pieces from the chit chat and odds and ends pack until I was happy with the placement of each piece then it was time to add the title I used Xmas for part of my title from the chit chat pack and the rest of my title from the this and that sticker sheet. Here are the products I’ve used. This layout is absolutely adorable!! That little reindeer is one of my favorites too! !